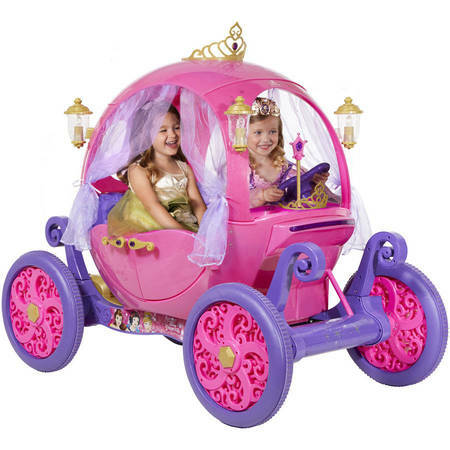 A celebrated fairy tale comes to life with the 24-volt Disney Princess Carriage Ride-On. Once a pumpkin, this elegant coach is ready to whisk your little princess off to the ball or to her next big adventure. 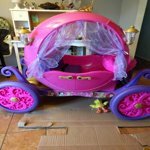 The beautiful pink Disney Princess ride-on is thoughtfully designed with graphics of popular Disney Princesses, gold accents, working doors and ornate interior details. 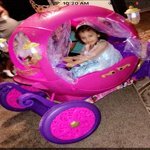 The spacious coach is large enough to bring along a friend and features a detachable "wear and share" tiara, a heart-shaped steering wheel and luxurious curtains. Girls will love the magical light-up wand and enchanting fairy tale sounds. 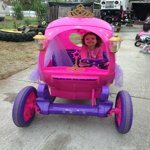 With the iconic 24V Disney Princess carriage by Dynacraft, your little princess can ride wherever her biggest dreams take her. 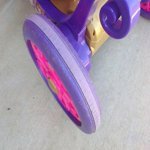 For registration information, visit http://www.dynacraftwheels.com/register-my-ride. Bought her this for her 4th birthday and was worried since it was so new and there's not a lot of reviews but she loves it! Her 11 year old sister rides with her! It's 24v so it's pretty fast! I do plan on buying a back up battery because they die out faster then I'd like but no complaints at all it's an amazing gift for your little girl! My nearly 2 and 3 year old grandaughters love it! They are too young to drive it yet. It goes pretty fast and they don't know how to control the steerin. 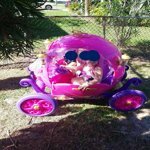 So I just let them play in the carriage under supervision. It is the cutest toy. They were so excited to see it. Ordered one as soon as we saw it. S2S, the box was banged up. And upon opening it, we learned the body was badly cracked. Find a store that actually carries it, so you can see the condition of the box. Putting it together is super easy! And the screws are PINK, so they blend in. Awesome attention to detail. Needs 18 hrs for first charge. My little prince chauffeurs my little princess around. This thing is a beast! Weight capacity is 130lbs! Going to get some good use out of it! We bought this for our daughter's 3rd Birthday! When I seen it online we just had to get it for her. I think I may have wanted it a bit more but that's besides the point! LOL. It is Huge and does take atleast 2 people to pick the box up. It can take 1 person to put together but very helpful with 2. The hardest part was putting the side curtains on!! I do wish the stickers came to where you can put them on yourself due to them being crooked in some parts but their already on once you buy. The only problem we really have with it is the traction grips on the tires in the back are already wearing off!! We ride it on pavement and in grass and it works pretty good on both. It can fit her at 30 some pounds and me at around 100 pounds and still rides great!! Her 10 year old brother even rides with her in it!! We Love It!!! Make sure you do charge a day before giving it to your child to ride and don't forget the batteries for each lantern and the steering wheel. It truly is a Fairytale Come True!!! love this carriage very easy to assemble. 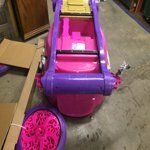 review the directions but follow the video .. written direction leave out the curtain assembly but I did everything in about four hours. I took lots of breaks and completed it start to finish in 4 hours. 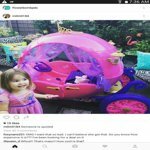 granddaughter is 3 and although they recommend operable for 3-7 years.. it goes to fast for 3 yr old child and most kids don't remember to hit the brakes when they are moving quickly and definitely not a toy to be driven on neighborhood roadways. but love the thrill of our lil princess smile and her excitement on her 3rd birthday..
broken parts. but there's a quality control approval sticker on it? For $330 and a CHRISTMAS gift for a child and 2+hours of assembly. I am disappointed that it wasn't received in perfect condition. it cannot be exchanged because walmart seems to not be selling it anymore? not to mention it weighs 111 lbs! 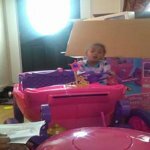 won't purchase from walmart for next Christmas. Too much money to be received like it was. I will have to upload the broken battery compartment later bc I accidentally deleted the photo. This is by no means Walmarts fault as they did everything right in making this better. But I will say this company is a joke. 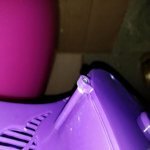 We bought this as a Santa gift for my children and had to go buy last minute items as it came completely cracked, where this company clearly overtightend the screws. The company refused to take any blame and refused to fix anything on it. They didn't even have enough professionalism to apologize. 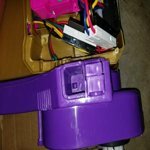 It is a very cute toy, but I am not sure it is worth the hassle of dealing with such a terrible and unprofessional company. Thank you Walmart for at least making this right. Got this for Christmas and after 6 months of use or about 15 total rides the grip on the back wheels split and came apart. The product has worked great to this point but is rendered useless without this grip. 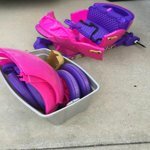 My girls love this and as Wal Mart doesn't sell parts I'm left at the mercy of the manufacturer. What's worse is the product has just gone out of warranty as if it was only meant to last this long. For $400 I expect much better longevity.